After you’ve gathered an initial group of people the best way to solidify the committee, gain additional interest and increase buy-in from the town is to start doing a project. Street light updates are a good first project because older, inefficient streetlighting is often a large expense for the town and switching to LEDs will result in immediate cost savings. Demonstrating the economic benefit of any project upfront will help with buy-in from local officials and residents. 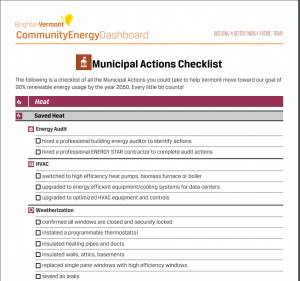 For ideas on what to tackle next after you’ve addressed the “low hanging fruit,” review the energy action checklists on the Community Energy Dashboard. The Dashboard also hosts a wide array of tools and resources. These include community success stories that can inspire action, an Energy Atlas that can help identify, analyze, and map existing and promising locations for renewable energy and energy efficiency projects, benchmarking tools to track progress against Vermont’s renewable energy goals, and a campaign tool to organize, track, and share local campaigns. Energy committees are made up of people from all walks of life and while some may be familiar with project management techniques, some may not be, so here are some suggestions to make your projects as successful as possible. For strategies and tips on maintaining committee morale, check out these thoughts on Volunteer Management another word or phrase instead of volunteer management? Don’t forget to publicize your successes! Stay present in your local newspaper, on a web page or on a social media site. 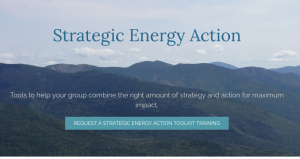 If you want more information about strategically making the most of your committee’s time and effort – we highly recommend the Strategic Energy Action Toolkit.